Saint Mouny English School, Aurangabad has advertised in THE LOKMAT newspaper for recruitment of Female Teachers jobs vacancies. Interested and eligible job aspirants are requested to attend interview on 15th April 2018.Check out further more details below. 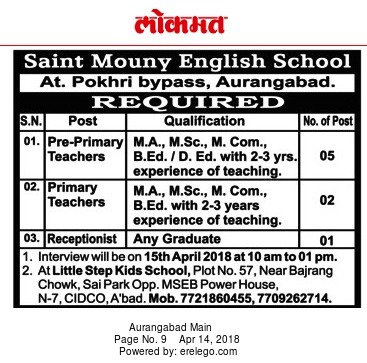 Name of the School: Saint Mouny English School, Aurangabad. About School: Saint Mouny English School, Aurangabad is a co educational institutions in Maharashtra. (a) Pre-Primary Teachers: M.A.,M.Sc.,M.Com., B.Ed/D.Ed.2-3 yrs Experience of teaching. (b) Primary Teachers: M.A,M.Sc,M.Com,B.Ed,with 2-3 years experience of teaching. At little step kids school, plot no 57, Near Bajrang chowk, sai park opp MSEB power house, N-7 Cidco Aurangabad.